So what does a school look like when it abandons all the playground rules? Expect to see children clambering up trees, play-fighting, scooter tricks and the odd bloody knee. 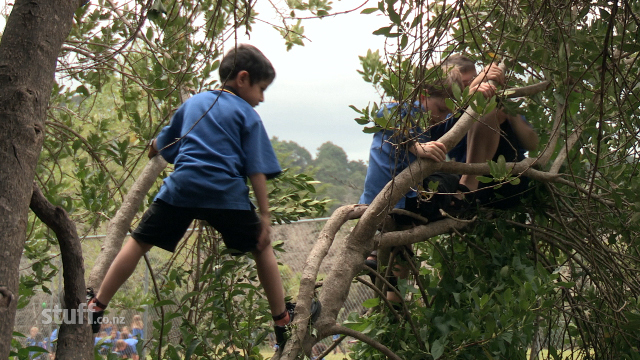 Swanson School principal Bruce McLachlan has became a global hit for his non-PC approach to playtime at the Auckland school. When children returned to class this week, Fairfax NZ was there to see if anarchy ruled. Scooters speed by, narrowly missing a group of basket players, but there's no head clash. Children can be spotted up a massive tree, a girl balances on the step's railing, while a boy flies by inside an old tyre. Zac, 11, follows us around the playground politely pointing out the children action. The stocky boy admits he used to get in a fair bit of trouble. "With the rules I got stood down three times. Now there's nothing to get stood down for." The principal said he has seen a transformation in Zac, from playing-up to playing nicely. McLachlan isn't your ordinary principal. His golden retriever dog Chelsea sleeps under the principal's desk. But there is reasoning behind his offbeat ideas. Research has shown a dog will reduce noise and keep children calmer in a classroom. Chelsea also sits with children in the sick bay to cheer them up and also helps children who struggle with reading. "You can read to a dog and that dog is not going to judge you ... it's never going to call you dumb," McLachlan said. The principal's phone hasn't stopping ringing with calls from schools and journalists since he made global headlines for his unconventional approach. A number of principals plan to visit the school to see it in action, he said. "It's resonated with people. There's been a lot of talk in recent years that we've gone too far in wrapping kids up in cotton wool," he said. "What kids are doing in their own time is what kids have always done in their time. .... And that's play. What we're doing in the school is letting that happen in break time." Teacher and associate principal Gail Thomson said children are now too busy having fun to fight. Although, she admitted she had to trust McLachlan when he suggested the idea. "I was a little bit scared I would be run over with the chaos, but it didn't happen. Children just got on with each other." Children need to have fun, play and use their imagination, she said. "As a child ... I liked to climb trees and build stuff. Our children today don't do that enough." McLachlan has some advice for parents wishing to encourage more free-time play. "Let the kids go out in the backyard and play and parents sit inside with a glass of sauvignon blanc. "Adults don't need to be involved in play. They will play naturally. It's something wired into a child."